Last Thursday, Governor Roy Cooper nominated Rep. Susi Hamilton (D-New Hanover) for the post of Secretary of Natural and Cultural Resources. The Department of Natural and Cultural Resources is in charge of state parks, museums, aquariums and historic sites, the State Archives and Library, and arts programs in North Carolina. Reid Wilson was named Chief Deputy Secretary. “Reid Wilson has helped preserve lands from the mountains to the coast and will be a great asset to the Department,” Cooper said in the statement. Governor Cooper today announced new leadership at @ncculture: Rep. Susi Hamilton as Secretary and Reid Wilson as Chief Deputy Secretary. As previously reported by American Lens, Hamilton used her state-provided email to promote a non-profit organization which contained a fundraising link. The text, “You can support our work by making a donation today” was found near the bottom of the email. By clicking the “making a donation” link, one is sent to Democracy NC donation page in support of the “Souls to the Polls” campaign. “Souls to the Polls” is also the name of the Moral Monday voter drive campaign. Official state email accounts are for conducting state business only and are not to be used for the promotion of donations to organizations or for electioneering purposes. By using her official state supplied email account to send an email containing a donation solicitation by an outside entity, Rep. Hamilton is possibly in violation of Ethical and Principle Guideline 7. An ethics complaint was filed by the NC GOP as a result of the report by American Lens, but we have learned that the complaint was apparently ‘removed’ at some point. It has been my honor to serve the fine folks of District 18. 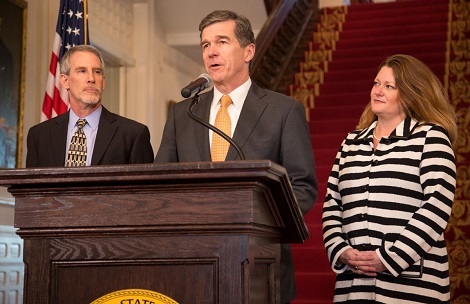 I look forward to serving all North Carolinians in my new position. However, it appears that Hamilton has blocked the author of our previous article, our Executive Editor A.P. Dillon. Hopefully, this is not an indication of how Rep. Hamilton will conduct business should she be confirmed. Governor Cooper has already come under fire for ‘banning’ a reporter from the conservative publication Carolina Journal from a December 5th news conference. This entry was posted in Am Lens, POLITICS NC, Roy Cooper and tagged Roy Cooper, Susi Hamilton. Bookmark the permalink.